How is the new Porsche GT3 comparing to the AMG GT R on the track? The good folks at Sport Auto that ran the AMG GT R Nurburgring record and also tested the car at the Hockenheim short track recently put the latest Porsche 911 GT3 (991.2) through its paces, including comparative runs on the same racetracks. They came away very impressed and had lots of accolades for the improvements over the prior gen. They stated that NO Porsche today has the stability of the GT R when driving at the limit. Can't read. Anyone have another link. ? The GTR is still faster around the Ring than the new .2 GT3, but the GTR is more comparable to the GT3RS(actually GT2RS) which will be updated soon, since the .1 has been out for 3 years now, and we'll then see how they will compare on the track. The GT3 .2 is still comparable to the regular GT which the GT3 smokes it all day every day. I want to see the GTR's on local tracks when they finally hit the streets in the U.S. to see if they can actually run consistent times lap after lap, this is where Porsche shines and is typically never matched. Here's a video using the previous/last GT3RS and Chris Harris still calls it The Daddy against the brand new, not even out in the U.S. yet GTR. If we really get tight on comparisons, the GTR should go up against the GT2RS, the GTs compares to the GT3RS and the regular AMG GT compares to a GT3, MB GT cars vs Porsche GT cars in that order. They are all sick cars and realistically most of us will never see the full potential of them, or 10/10's of their ability. The new .2 GT3 ran a 7:12, not a 7:18 as said in the article. Well, that was stated it the article as well but the 7:12.7 was not driven by an independent team with comparable conditions. Porsche time was done on the "perfect" day for an NA engine by a Porsche factory driver (outside temp was 50F and asphalt temp was 57F). Last edited by Wolfman; 08-05-2017 at 06:15 PM. I am sure that the new gen. cars will be better and they better have to be for Porsche to maintain their reputation. In any case, all of these are awesome cars and I am just amazed to see how fast AMG was able to encroach on the 911 territory with a real sports car. Last edited by Wolfman; 08-05-2017 at 06:35 PM. I speak a little German and got the drift of the article. Props to Porsche but it seems they don't give you their best effort unless their back is up against the wall. Times have changed and the physics of hanging all that weight aft of the rear axel has now caught up with them no matter how much they have band aided the engineering. Rowing the gears at 9k rpm is nice on the track but a pia on the street. The stubborn Swabians need to look to the mid engine Cayman for the balance. Even Walter Rohrl admits his favorite Porsche is a Cayman GT4. 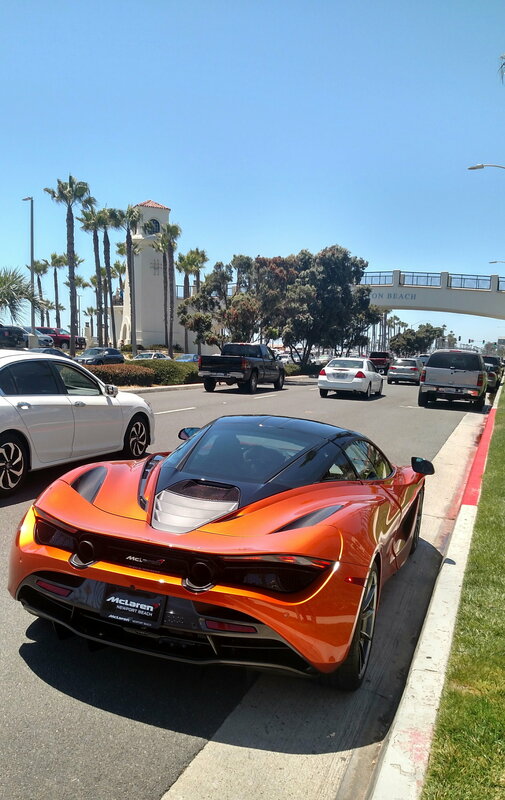 Porsche's looking in the wrong rear view mirror, it's not AMG but McLaren that's coming. It will be interesting to see how the 911 GT2RS compares with the McLaren 720 and ...oh the AMG GT BLACK SERIES. Can't wait for that internet war. Last edited by NewportSLS; 08-06-2017 at 07:35 PM. Oh so you've driven a GT2rs and the black series AMG GT eh? Man go back to your leatherique treatments. The 720 is going to be a great car at 400k. AMG GT-R did fairly well at Nurburgring sitting at Number#9 overall. The Black Series whenever it comes out will do better than the GT-R I think. How much, that remains to be seen. The proper match up for the GT-R is the GT3RS by PORSCHE. The soon to be released in Europe GT2RS lap times will be published 3Q or 4Q this year. PORSCHE ran lap times on differing tire brands. More than likely PORSCHE will publish the lap time with factory standard Michelin Cup 2 titles which will be as good if not better than the Huracan Performante lap time which used Trofeo R tires, and not the standard factory tires. Actually, the top AMG gt car is the GTR(as of right now). The top Porsche GT car is the GT2RS, which I hear ran some times. 6:47 and 6:53 around the Ring, tires and times to be announced in September,either the Cup 2 N2 or the Trofeo R, crazy fast. I'll put money on it that the Black Series AMG won't touch those times, which would have to be 17 seconds faster than the GTR to get even with the GT2RS on stockers.. . Damn those Beetles are quick, even with the engine hanging out of the ***.... lol . And the Huracan did its times on Trofeo tires, not stock tires which you would get from factory at purchase. Last edited by RobbieRob; 08-09-2017 at 08:15 AM. I personally do not think that the natural Porsche competitor to the GT R is the GT3 RS, but rather the GT3, as they are so similar in price point. The GT R BS will be the car to compete with the 991.2 GT3 RS. Hoping the GT-R have no issues whatsoever as it stands to be the current flagship sports car model for AMG. As time progresses we will see. Those would be phenomenal times and I expect at least the GT2 RS to do great. After all, this is a 700HP track car. Personally I find factory driven records a bit more suspect as there always seems to be a question of how "special" those cars happen to be. There was plenty of controversy around the Lambo timing, the Nissan GTR and of course the original 918 lap time as well. Part of the reason is of course that nobody has been able to match those times using the same model cars. If you go by this philosophy, then what Ferrari, Lamborghini or McLaren does the GTR match up against? Since all their base prices are well above the Merc. Don't forget, the base price of a Porsche GT3 is 143k, well under the base for a GTR. Well there are very few owners getting a new GT3 for $143K. With just a few options the car is easily at $160K plus, which puts it in GT R territory. Perhaps I should have stated it this way: both the GT3 and the GT R are track capable street cars, whereas both the GT3 RS and the AMG GT BS variant are far more track oriented than their cousins. Hence IMHO are natural competitors. When the PORSCHE 918 Spyder clocked in at 6:57 back in 2013, the car they ran at Nurburgring has the exact same setup that the 918 Spyder owners now have. No other tweaks like better tires or extra tuning from the original engine was done. That was one of the selling points handed out to 918 Spyder owners when it was open for sale. One of the many things I like with PORSCHE, when they do publish lap times at Nurburgring, they publish what they actually sell identical from the production line. As a matter of fact the new GT2RS could have been made to have 740BHP, but PORSCHE Engineering Management scaled it down to 700BHP. I do know from reliable sources from the onset that the new GT2RS is very capable of beating the 918 Spyder lap time in Nurburgring. Competition is very tough at the highest echelon of specialty cars. Well this is a misguided post as the warranty only applies to the limited issues that lead to complete engine failures on all 2014 GT3s. But good for them for covering defective top ends of the engines, but what about the metal shavings that have been deposited into the bottom end ?? Last edited by AMG 17GT; 08-10-2017 at 05:24 AM. Whoops. 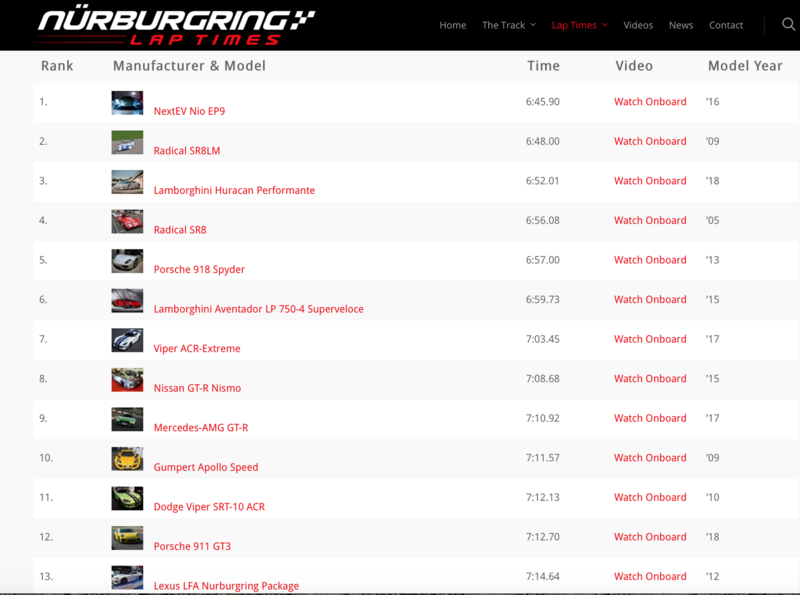 Where's the coveted GT3RS in this list?? Can't see it here. Yo quack outlaw, let me help you read the lap times of GT3RS. I posted it here since you are posting unfounded lap times in the internet anyways. For all time it stands at Number#16 for now. That is the older GT3RS from 2010. The new 991.2 will come out in about two years or so. It will more than likely leap frog the GT-R, but we will see. I got my GT3RS back August of 2015 so it has been three wonderful years. I would be surprised if there is no car manufacturer out there that cannot do better in three years time. You should try buy at least a Cayman (that one you can afford) and that will open your eyes how great the engineering that comes with PORSCHE. Don't be a one-track mind wannabe who just buys a Merc. Merc is a great luxury car. By the way, when my GT2RS comes out, that will be one heck of car ROMEOE55. Last edited by amgfan1; 08-10-2017 at 07:58 AM. Reason: Typo correction. I suggest you go back to school and retake english, science, and math all over again. Somehow your comprehension is nil to none. Yeah it was a failed finger follower right? And cams?